A little bit more fancy than our normal units. 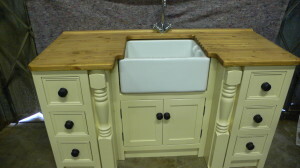 this ‘pilaster’ feature sink unit has pilasters set either side of the stepped in sink, the drawer surrounds are beaded and the unit has been painted in ‘ringwold ground’, (or another colour of your choice), with contrasting ebonised handles added to doors and drawers. The 27mm pine worktop has a 40mm upstand and has been stained and waterproofed with wax.